The second half of the nineteenth century witnessed a series of international exhibitions displaying fine and decorative art from around the world in a rich and competitive environment. Rivalry between England and France, regarding the content and success of such exhibitions, was particularly rife, as nations strove to establish a pre-eminent reputation in design and methods of manufacture. This piece was displayed at the London 1862 International Exhibition by the French national factory Sèvres, when it was described as a coffee-pot. Of 'Oriental' inspiration, the elephant shape demonstrates the fantastical imagination of the designer and decorator Marc Louis Solon, the piece being a wonderful combination of humour and artistic excellence. It features the pâte-sur-pâte technique, which involved building up low sculptural relief on the surface of an unfired pot with successive layers of slip - a technique that Solon was later to bring to the Staffordshire factory of Herbert Minton. Ceramics featuring pâte-sur pâte gained great popularity in both France and England and were expensive, luxury items. 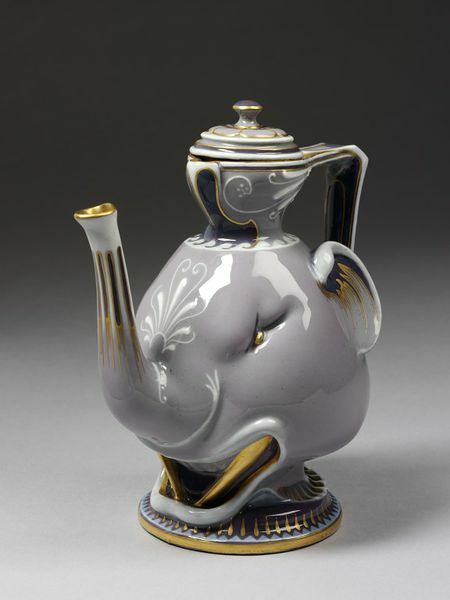 This coffee-pot employs the technique in delicate moderation to highlight the form of the elephant's face. Soon after its foundation in 1740 the Sèvres factory established itself as one of the greatest porcelain factories in Europe. Initially catering to the tastes of the French court, the factory maintained a reputation for opulence throughout the nineteenth century. In the 1750s it produced the popular 'Elephant Candelabra Vase', designed by Jean-Claude Duplessis, and has since used the elephant, a symbol of magnificence and luxury, as the inspiration for the design of a number of ornamental wares. 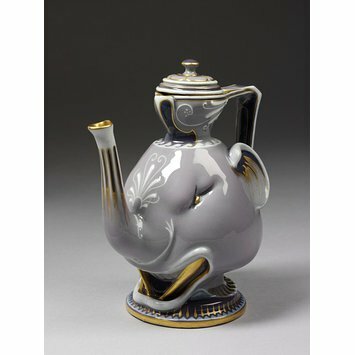 Coffee pot and cover in the form of the head of an elephant. Porcelain with pâte-sur-pâte decoration and gilt. Liefkes, Reino and Hilary Young, eds. Masterpieces of World Ceramics.. London: V & A Publishing, 2008. pp.116-117, ill ISBN 9781 851 775279.